****Sorry we won't quote training fee from SMS or watsapp as we need more details to quote accordingly! 6. We don't waste your time by providing just Basic Obedience with for 8 or 10 lessons with every lesson doing the same exercise as this can be taught with half to 1 hour training. * If you want " our quality training and services", we need to know more details according to your dog's problem, breed, age and what you want. We will quote you according with different courses for you to choose. No obligation after quote is up to you to decide. $150/hr or $200/ visit (only teach tricks and obedience) trainer don't touch your dog. or $1,400 to $1800 (full course). Training fee can be high or very low, what is being trained and how you and your dog is train is more important????? Please call during 10am to 9pm for details! Mica goes for re train due to behavior changes " Bits owners while being carry"! Luckily, owner quickly consult us immediately and goes for retrain instead of bad to worst habits being form! Dog's behavior are subject to changes due to incident(s) happened. It is best to get it solve in the early age or stage rather then wait! Usually trainer will not hands on with aggressive dog instead of training the dog they just talk and give advise or use training tools on the dog! 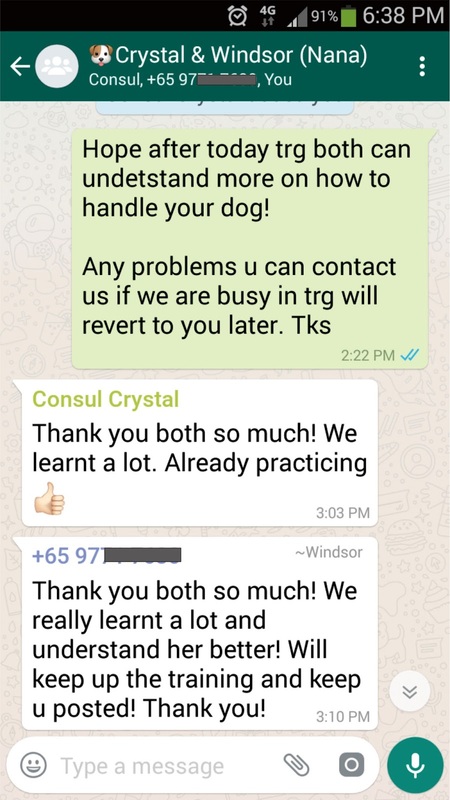 Owner are willing to pay for aggressive training which is more costly but finally his dog problem was not so serious and furthermore it was trained by us, only charge a very decent fee! Owner take up the puppy interactive training! Owner take up the 2 days "Puppy Interactive Training"! The earlier you train a puppy the better you can control them! Mold them to fit into your lifestyle! Don't wait till problems form very badly then you try to correct them! 3 month+ Kyoshi Japanese Spitz taking up the "Puppy Interactive Training"
He likes to bite toes, jump, lazy to walk........ Japanese Spitz are usually having stubborn characters and do not like to be push around. A correct and proper training is needed during the early age! Don't wait to problem(s) comes then you start to "CORRECTING" them! 2 months+ old Bella Golden Retriever take up the 'Home Puppy Interactive Training"
Bella has been biting the whole family, owner legs with lots of bruises create by her! 2 months old - Hunter Shetland Sheepdog taking up the "Home Puppy Interactive Training"
Our training and service support helps owners' save $$$$, as it is value for money that benefits both owner and dog! For Dogs Training it can't be compared, unless you dare to try out and know the differences! Bubble 5 months old cockapoo take up the home puppy interactive training! ** Dogs Training is NOT only about on PRICE or DAYS! hands-on, on your dog and show you how to train or just by talking? ~ After training is there any followup? ~More important is, can they commit on what they promise? YOU CAN'T COMPARE THE DIFFERENCEs TILL YOU ARE WILLING TO TRY THE 2nd or 3rd person SERVICE ! Big Foot 5 years Old Italian greyhound & Zuzu 2 years Old Italian greyhound, both take up a 1 day Home Consultation training! Some dogs' owner maybe skeptical, can 1 or 2 days train a dog? In our course or courses we can have 4 days or 6 days or even 10 days but why wasting time! - If each lesson is 1 or 1.5hrs and the trainer is in the rush or always doing the training exercise or can't teach, can you learn anything or are you wasting your time? - If we break our course into 4 days with 4 visiting lessons, are you willing to pay extra for our transport & time? ** In our course we make sure, we'll spend valuable & quality time to provide the owner more beneficial knowledge and skill on how to training their dog! If owner really need us to come for another visit to guide them, they will just pay a decent fee will do. So far majority after much practice on what we taught, they have no problem handling their dog! 10 years+ ago, Hershey in Home Puppy Interactive Training! 2.5 months+ old Max Shih Tzu take up the Home Puppy Interactive Training! In our training we allow owner to ask any questions on their dog, Some problem(s) need more time to see how it happened. We believes in spending longer quality time to teach till the owner understand what was taught rather then provide more days with only 1 or 1.5hr per session rushing with the time and wasting money! What owner want for training is Beneficial and Value for money training! Problems: Like to bite legs, toilet training, dun like to be touch on the face, pick up anything on the floor to chew or eat! Please Note: Aggressive problem(s) will take time to correct and control! Best is to get your puppy train as earlier as possible, DON'T let bad habits turn from bad to WORST! We are conducting "Behavior and Temperament" training NOT repairing a television where owners always ask for quick and immediate result when they had an aggressive dog! Worst incident happened here, an adult dog has bitten his owner and the hospital bill in Singapore $8,000.00! Whether can the trainer trained or a newbie - Standard market rate for home training is $120 to $150 per hour, so for "aggressive adult dog" don't expect a cheap training fee! We have encountered "dishonest Dogs' Owner", when making enquires said their dog is a puppy and do not have aggressive problem so that they can have a cheaper training fee but upon confirmation during visit it is a different stories! If owners gives "false info" in order just to have a lower training fee, we will have the rights charge you a transport fee of $80 because you are wasting our time as we are already at your place and due to you don't accept the actual training fee for aggressive training and also cancel the training! ** Dishonest Dogs' Owner, please stay away from our service or else we'll publish you in our facebook for all to see! Dishonest Dogs' Owner - Some people you can never be trust! 3) He claim his dog only 4 to 5 months puppy , Jack Russell want a normal training! 4) Upon reaching his home outside, both a 7 year Maltese and an almost adult mogrel barking, growl and charging at the main gate where we stand trying to reach us and bite! 5) Found out from helper both dogs has been bitting visitors before and any visitors that comes into the house, both dogs have to be confine to one side. 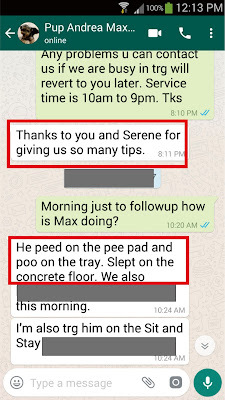 6) Waited about 10 mins for owner to be down, I try to get a final check and ask why he want to train his dog but he still denied that his dog is "NOT Aggressive" till i mention what he told my assistance (Vet advise owner to have his dog domestically train) and what his helper told me (His dog has bitten visitors before)! 7) Then he admit his dog bite the vet, helper ......etc after further conversation. 8) I then told him straight his dog is not a Jack Russell and the age in not 4 to 5 months, he still denied till I proved to him and he look into the vet consultation card it show breed "Morgrel". 9) Ask him again, when dogs go for a walk outside the house did this dog charge and bite passerby or other dogs before. He still denied again till I told him to bring his dog outside the house, this dog saw a road cleaner walking passby, she bark and charge at the cleaner. So I bring this dog away from the owner, from far saw a girl with a dog whom is staying nearby was so afraid to walk by us. It proven his guy is really dishonest! The neighborhood people will know better what kind of dog he has. 10) This owner didn't accept the fee for aggressive dog training as my quote to him is only for normal training fee which he is trying to take advantage of and worst he didn't pay me for the time he book my appointment and transport to travel to his place! What a Dishonest, Selfish & Irresponsible person! ** This owner he has been wasting my time as my training usually start from 10am or 10.30am and he wanted the training to be at his place at 9am! I told him aggressive dog training is not the price I quoted and furthermore owner has been hiding a lot of things by trying to get a cheaper deal and he is not willing to pay to get his dog train! *** Last warning to those dogs' owner whom behave like the same person above, you are "Not Welcome" to call us or engage our service! This time I will give no chance by embarrassing the person with their face and address posted here for everyone to see! 2.5 month Neko Shiba Inu take up the 2 days Home Puppy Interactive Training"
Toilet Training need not to have so many days to trained. from the dog behaviors being form and some little details that the owner has over look! 6 months old Veera Pug Mix taking up the Home Puppy Interactive Training. Problems: Toilet Training, Hyperactive, likes to play bites, pickup socks and anything on the floor. toys, food from kids, pickup things on the floor and don't like to walk on leash! 5 Month+ Oreo French Bulldog take up the 2 days Home Puppy Interactive Training! We don't believe in giving EMPTY PROMISSEs, to win your deal! 3 months+ Cherry Japanese Spitz take up the 2 days "Home Puppy Interactive Training"
Problems face: Biting and aggression. agrressive or naughty, try divert them with treats! ASK YOURSELF, IS THIS LOGICAL? Some may said don't shout or scold your dog???? Dogs training is not only talking it depends whether the person or trainers dare to hand on touching your dog! For Adult Dog with "Aggressive Problem" fee *FROM $1.2K to $5K! We don't quote thru SMS, Whatsapp & Messages, as certain course are conducted on certain days! To Know More, "No Obligation" to call us, thanks! Problems: Food & toys Possessive & guarding bites, Demanding and Harassment at owners that has some human/ dog food in their hands, don't listen to command, don't like to be touch and can't sit still! Get your puppy trained as early as possible, is important. Don't wait till problem(s) form very badly then you expect speedy result! Control and mould them, when they are puppy not Correct when mistake are badly form! Re-home 7 months old Moshi (Shih Tzu) take up the 2 days Home Puppy Interactive training! Owner Prefer their dog to be outdoor toilet train as they don't mind to spare sometime teaching Moshi how to pee & poo there! No More Treat as you can't always relied on treat to train the dog all the time! Owner try without treats for recall! 4 months old Shiro Japanese Spitz take up the 2 days Puppy Interactive Training! He was trained before around 3 months old but the ex-trainer (dog behaviorist)dare not touch him and during all the training lessons just talking instead of showing the owner how to train her aggressive dog! For people that are not willing to pay, will said our fee is high or pricey but for people are willing to pay will, they get some dog trainers(behaviourist) that only "do the talking" for all the lessons but no practical training exercise was done(they don't even dare to touch a aggressive puppy) and these trainers are charging $120 to $150 per hour! If our fee is pricey or high then I believes these people that just only do the talking are really making good money! Please note every dog trainers or dog behaviourists are differences and what we taught, experience, skill and service are also totally different! You can't base on price or the number of lessons to guage on the service till you dare to try all the services! 6 months old Lexy Dachshund take up the Home Puppy Interactive Training Thanks to Nicholas for the recommendation on our training! 5 months old Snowy Japanese Spitz take up the 1 day Home Consultation Training. Snowy has attended class socialize training before the owner engage us! Dogs obedience training and behaviour training are difference! Obedience training takes minutes or a few hours to get immediately result but for behaviour training is depending on how serious the problem(s) has inherited! For Obedience result to be better, owner need to continue practicing to re enforce their training as for behaviour training it depend on the problem (like aggressive, hyperactive, toilet training, bad habits...) and also what type of solutions is taught to solve these problem(s). 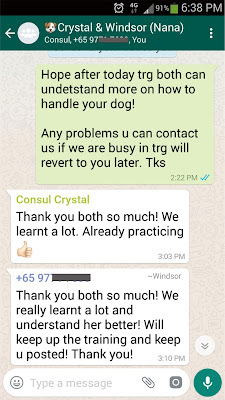 So DON't ask for "fast result guarantee" if the dog have not gone thru the training yet, as result will be there depending on whether how the trainer teach with only 1 solution / multi solutions or whether the owner is following on what was taught or how bad or worst is the behaviour problem(s) being form. Why you can see "fast result" in our videos with NO gimmick? We don't waste time and also drag your training to make you pay +++! So get the problem(s) fix or in control before things goes from bad to worst! 5 years old Lucky shih tzu take up the 1 day "Home Consultation Training"
Owner cannot leave the maindoor open as he will bark vigorously and charge at anyone outside, need to spoon feed then he will eat, charge at helper that take or clean his pillow, Bark at hand phone rings, bark and chase moving object.. Owner comment she had not open the main door ever since he starts barking and charging people outside till we came! M & Y 3 months old Chihuahua taken up "Home Puppy Interactive Training"
3 months Old Libby Pug take up 2 days Home Puppy Interactive training. We not only train your dog, we train you to train your dog! We don't give/ charge "more lessons" (days) to waste your money and drag your time by doing the "Same" (repeating SOP) exercise on every lessons rather then to teach you the right methods in handling your dog and our syllabus are always value for money! Once you understand all tips, all you have to do is, self practice to get a better results, unless you want to "pay extra" $$$$ for us to repeat again and again on the same training! *For behavioural problems solving, dog are solved individually according to individual dog with varous medthods but not on "only one solution" for the problem! Pls note: Not all Obedience training will cover your dog's Behavioural problems! For problem(s) solving on behavior like aggressive, toilet training, barking... it may take time to solve, if owner has delay the time to train their puppy/ dogs. Results will be depending on how bad & long the habits was form! So don't ask "stupid question for immediate results Guarantee", is behavioural problems solving (living things), not replace IC chips or spare parts(machines)! So get your puppy trained earlier (proper training) rather then to correcting bad habits that was form for weeks, months and years! 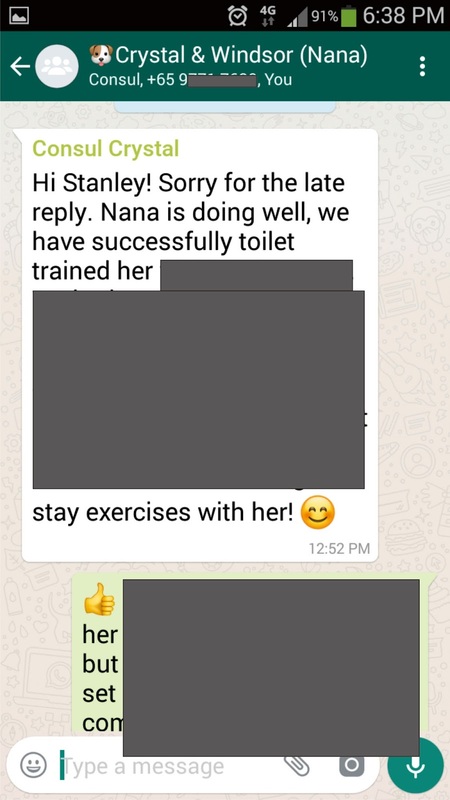 For our "Home Puppy Interactive training" 100% our clients will feedback "So much things to Learn" rather then "learn the same old thing for every lessons"! Our fee(s) are standard and fix base on what we train, if you want a discount price then name me your price but don't ask me how and what I train! Problems: Toilet training, No Confident to walk in the public, separation anxiety, jump at owner. For training Is not the number of days/ lessons, it is "VALUE" of what is train, you can have 5 or 10 lessons training but every lesson you are repeat with the same old thing or exercise, how will you feel? Problems: Toilet training, bites toes and hands, don't listen to commands, jumping, hyperactive, no attention..
Max 5 Months Morkiepoo Terrier take up the 2 days Home Puppy Interactive Training! Every results is credited to the dog owners on the effort they put in, as how are we going to guarantee result if you don't put in the effort or your expectation are too ridiculous as we train you, your family and your dog NOT repairing a television! Those who took this course will understand the value of it, as recently a client told me a basic grooming course will already cost them Sin$350.00! Happy 2 years 11 months poodle take up the 1 day Home Consultation training. 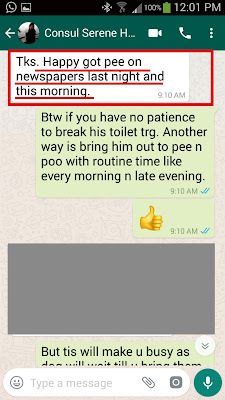 Problems: Toilet training & marking never pee & poo at home before for almost 2 years! During training found bad separation anxiety, timid and some aggressive problems! What we teach is how to break, how to solve if there is mistake(s) in various ways, how to prevent future mistakes and how to prevent bad habits! Owner must stay calm to listen properly so when there is mistake happened they can think straight!